2018 marks the 125th anniversary of the famous ‘Villuvandi (ox-wagon) Yatra’ of Mahatma Ayyankali in Kerala. 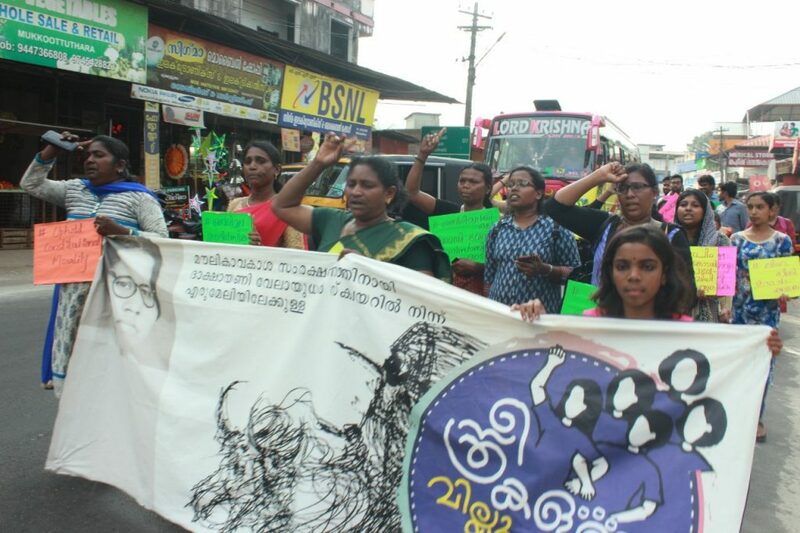 In commemoration of the historic event, a group of Dalit activists organised a second ‘Villuvandi Yatra’ in the wake of the changed situations in Kerala following the Supreme Court order allowing entry for women of all ages to the Sabarimala temple. Raising the slogan ‘Sabarimala for Adivasis, let Thanthris get off’, several ‘villuvandis’ (motor vehicles called villuvandi) started from different parts of the state and all joined together at Erumeli in Pathanamthitta district on December 16. 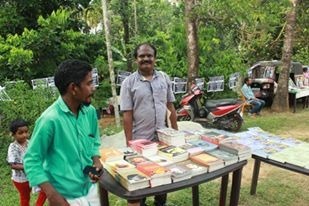 The convention at Erumeli was organised by the Sabarimala Adivasi Rights Restoration Committee, led by activists Sunny M Kapikad, P Geethanandan and Santhosh among others. The first ‘yatra’ started from the Ayyankali Smrithi Mandapam at Venganoor in Thiruvananthapuram on December 13 and was led by Dalit rights activist Sunny M Kapikad. 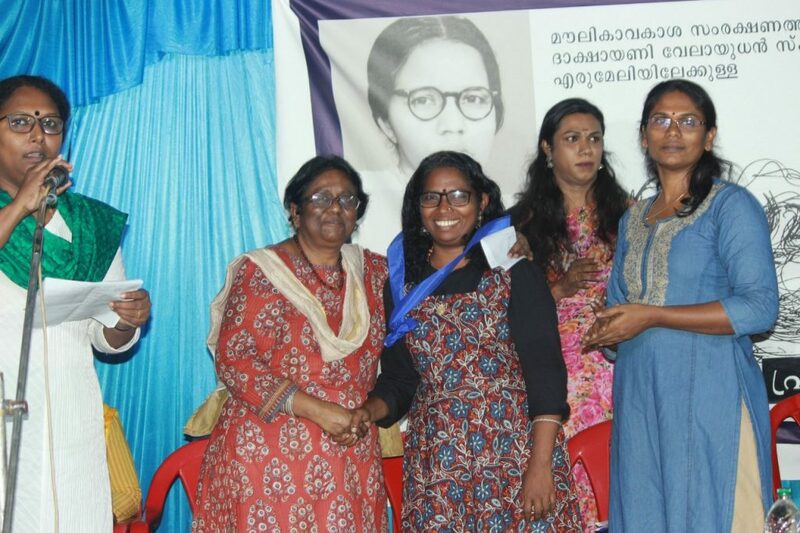 Women, Adivasis and Dalits will enter not only the Sabarimala but rather all places that they are forbidden, proclaimed Dr Rekha Raj, academician and Dalit activist, while inaugurating the ‘villuvandi yatra’ in Thrissur district on December 15. Teams from Kozhikode and Vaikom also joined the others at Erumeli. The ‘women’s villuvandi’ was inaugurated at the Vanchi Square (named as Dakshayani Velayudhan Square for this programme) at Ernakulam on December 15, when Meera Velayudhan handed over a copy of the Indian Constitution to Adv Jessin, captain of the yatra. Meera Velayudhan is the daughter of Dakshayani Velayudhan, the first and only Dalit woman to be elected to the Constituent Assembly in 1946 and signed the Constitution. The women’s villuvandi was organized by Dalit women alone, though other men and women also participated, and the ‘yatra’ started to Erumeli the next day. 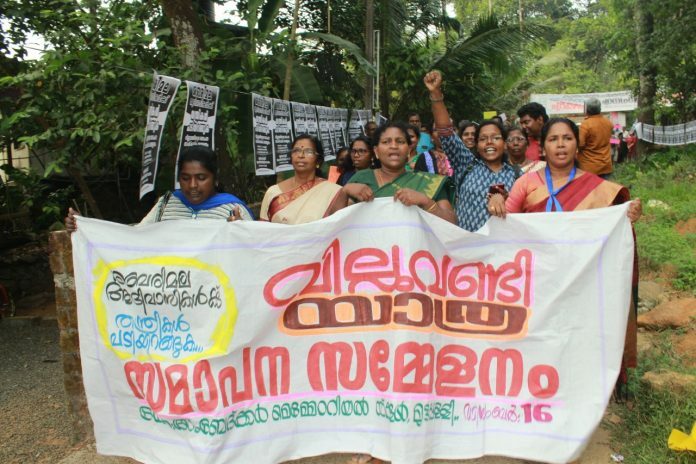 “We see the issues related to the women’s entry to Sabarimala as a reflection of the Brahmanical caste system”, Dalit activist Bindu Thankam Kalyani told TwoCircles.net. “The Devaswom Board is a government body with employees taking government salary. They are concerned whether the avarna people would come up into lucrative posts like that of the chief priest in the Board. And they are trying to establish the right of the Thanthri family and the Panthalam palace over the temple, thus others could be left out. Fear of losing the lucrative positions with government salary is the base of their tensions,” she added. She also pointed out to the fight of the Sangh against the communist regime as another factor. However, referring to the large number of women who participated in the ‘Namajapa’ processions organised by those opposing women’s entry to the Sabarimala temple, Bindu expressed her doubt whether it was modernisation or reformation that took place in Kerala. “Modernisation has taken place – in dressing, houses, way of living etc. But there has not been any change in the caste-based structure and attitude towards it,” she said. The historic Villuvandi Yatra was organised by the reformist leader Mahatma Ayyankali in 1893 against the various forms of oppression suffered by the lower castes. The castewalls had forbidden the lower castes from even walking through public roads, dressing themselves up properly, getting educated etc. Ayyankali protested against the inhuman practices by travelling in a ‘villuvandi’ or a belled bullock cart owned by him, at a time when the lower castes were not allowed even to own a bullock cart and the higher castes used the bullock cart as a show of pride and strength. He walked well-dressed, with an overcoat and a turban at an age when Dalits were not allowed to dress themselves up properly. Even Dalit women were not allowed to cover their upper body with any type of clothing, but rather could wear only a chain with stones (‘kallumala’). Ayyankali became a member of the Sreemoolam Prajasabha (the then legislative assembly) in 1911 and held the position for 25 years, adding the Assembly too to the list of stages for his struggle.